Stratus clouds are low-level cloud characterized by horizontal layering with a uniform base, as opposed to convective or cumuliform clouds that are formed by rising thermals. More specifically, the term stratus is used to describe flat, hazy, featureless clouds of low altitude varying in color from dark gray to nearly white. The word "stratus" comes from the Latin prefix "strato-", meaning "layer". Stratus clouds may produce a light drizzle or a small amount of snow. These clouds are essentially above-ground fog formed either through the lifting of morning fog or through cold air moving at low altitudes over a region. Some call these clouds "high fog" for the fog-like cloud. While light rain may fall, this cloud does not indicate much meteorological activity. Stratus clouds form when a sheet of warm, moist air lifts off the ground and depressurizes, following the lapse rate. This causes the relative humidity to increase due to the adiabatic cooling. Stratus clouds can also form in a similar manner to fog when the ambient air temperature decreases, increasing the relative humidity. Once the temperature drops below the dew point, a stratus cloud can form. Stratus clouds look like featureless gray to white sheets of cloud. They can be composed of water droplets, supercooled water droplets, or ice crystals depending upon the ambient temperature. Stratus nebulosus clouds appear as a featureless or nebulous veil or layer of stratus clouds with no distinctive features or structure. They are found at low altitudes, and is a good sign of atmospheric stability, which indicates continuous stable weather. 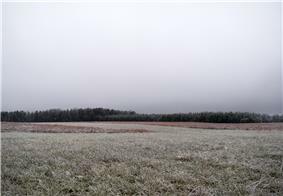 Stratus nebulosus may produce light drizzle, or flakes of snow. Stratus fractus clouds on the other hand, appear with an irregular shape, and forms with a clearly fragmented or ragged appearance. They mostly appear under the precipitation of major rain-bearing clouds. These are the nimbostratus clouds, and the cumulonimbus clouds, and are classified as pannus clouds. Stratus fractus can also form beside mountain slopes, without the presence of nimbus clouds (clouds that precipitate), and their color can be from dark grey to almost white. Stratus fractus are not divided into varieties, but stratus nebulosus on the other hand, are divided into two. The Stratus opacus variety appears as a nebulous or milky sheet of the nebulosus species, but are opaque enough to block the sun from view. Stratus Translucidus is another variety of the nebulosus species. These clouds are considered more thin than the opacus variety because this cloud is rather translucent, allowing the position of the sun or moon to be observed from earth's surface. Stratus cumulogenitus clouds occur when the base of cumulus clouds spreads, creating a nebulous sheet of stratiform clouds. This can also occur on nimbostratus clouds (stratus nimbostratogenitus) and on cumulonimbus clouds (stratus cumulonimbogenitus). Stratus fractus clouds can also form under the base of precipitation-bearing clouds and are classified as pannus clouds. Stratus clouds don't produce accessory clouds, but a supplementary feature praecipitatio is derived from Latin, which means "precipitation". Stratus clouds are too low to produce virga, or rain shears that evaporate before reaching the ground. A stratus cloud can form from stratocumulus spreading out under an inversion, indicating a continuation of prolonged cloudy weather with drizzle for several hours and then an improvement as it breaks into stratocumulus. Stratus clouds can persist for days in anticyclone conditions. It is common for a stratus to form on a weak warm front, rather than the usual nimbostratus. According to Sednev, Menon, and McFarquhar, Arctic stratus and other low-level clouds form roughly 50% of the annual cloud cover in Arctic regions, causing a large effect on the energy emissions and absorptions through radiation. Cirrostratus clouds, a very high ice-crystal form of stratiform clouds, can appear as a milky sheen in the sky or as a striated sheet. They are sometimes similar to altostratus and are distinguishable from the latter because the sun or moon is always clearly visible through transparent cirrostratus, in contrast to altostratus which tends to be opaque or translucent. Cirrostratus come in two species, fibratus and nebulosus. The ice crystals in these clouds vary depending upon the height in the cloud. Towards the bottom, at temperatures of around −35 °C (−31 °F) to −45 °C (−49 °F), the crystals tend to be long, solid, hexagonal columns. Towards the top of the cloud, at temperatures of around −47 °C (−53 °F) to −52 °C (−62 °F), the predominant crystal types are thick, hexagonal plates and short, solid, hexagonal columns. These clouds commonly produce halos, and sometimes the halo is the only indication that such clouds are present. They are formed by warm, moist air being lifted slowly to a very high altitude. When a warm front approaches, cirrostratus clouds become thicker and descend forming altostratus clouds, and rain usually begins 12 to 24 hours later. A stratocumulus cloud is another type of a cumuliform or stratiform cloud. Like stratus clouds, they form at low levels; but like cumulus clouds, they form via convection. Unlike cumulus clouds, their growth is almost completely retarded by a strong inversion, causing them to flatten out like stratus clouds and giving them a layered appearance. These clouds are extremely common, covering on average around twenty-three percent of the earth's oceans and twelve percent of the earth's continents. They are less common in tropical areas and commonly form after cold fronts. Additionally, stratocumulus clouds reflect a large amount of the incoming sunlight, producing a net cooling effect. Stratocumulus clouds can produce drizzle, which stabilizes the cloud by warming it and reducing turbulent mixing. ^ "Definition of Clouds" (PDF). p. 17. Retrieved 11 August 2015. ^ a b c d "Cloud Classification". National Weather Service. Retrieved 2 January 2014. ^ a b c "Stratus Clouds". Weather. ^ a b c d e "International Cloud Atlas" (PDF). World Meteorological Organization (WMO). p. 43. Retrieved 11 August 2015. ^ a b "Common Cloud Names, Shapes, and Altitudes" (PDF). Georgia Institute of Technology. pp. 2, 10–13. Retrieved 12 February 2011. Ackerman, Steven A; Knox, John A (2003). Meteorology: Understanding the Atmosphere. Brooks Cole. Ahrens, C. Donald (February 2006). Meteorology Today: An Introduction to Weather, Climate, and the Environment (8 ed.). Brooks Cole. Day, John A. (August 2005). The Book of Clouds. Sterling. Grenci, Lee M.; Nese, Jon M. (August 2001). A World of Weather: Fundamentals of Meteorology: A Text / Laboratory Manual (3 ed.). Kendall/Hunt Publishing Company. Hamilton, Gina. Blue Planet – Air (eBook). Milliken Publishing. Parungo, F. (May 1995). "Ice Crystals in High Clouds and Contrails". Atmospheric Research 38: 249. Wood, Robert (August 2012). "Stratocumulus Clouds" 140 (8).